One of the most beautiful, passionate films about the life of Jesus Christ was directed by an atheist, Marxist gay man. Pier Paolo Pasolini’s The Gospel According To St. Matthew doesn’t so much attempt to deify Christ as return him to the sort of figure he is throughout the Gospels, someone who would have very much enjoyed breaking bread with Pasolini, the sort of person the modern church might push away. Throughout the Gospels, Christ simply enjoys the company of people, being around them and talking to them and eating with them. It’s fitting, then, that a Marxist would most emphasize that side of Jesus’ character. Here is a man who was not above the people, but came out of them. Those who killed him were those who held the power, and his resurrection was a triumph not just for Christ himself, but for all he represented. Many films based on the Gospels boil their stories down to one week in Christ’s life: the week of his death and resurrection. Pasolini pushes the events of the Passion into roughly the final 25 minutes of a two hour and 17 minute film. His movie is much more concerned with the bits of Matthew in which Jesus wanders the countryside of Judea, preaching to those who will listen and healing those who come to him. A moment in the film’s first half captures perfectly the appeal of Jesus, even to those who don’t believe. Christ, having resisted the temptations of the Devil in the wilderness, walks all the way from said wilderness to the shores of the Sea Of Galilee, passing farmers and other tradesmen on the way. Once he reaches the sea, he spots Peter and Andrew, the brothers who become his first disciples, then calls them each by name. Pasolini’s camera zooms in on each face tightly as their lives are changed, called by a man they’ve only just met but find immediately arresting. Pasolini’s approach to this oft-filmed story is unique throughout. 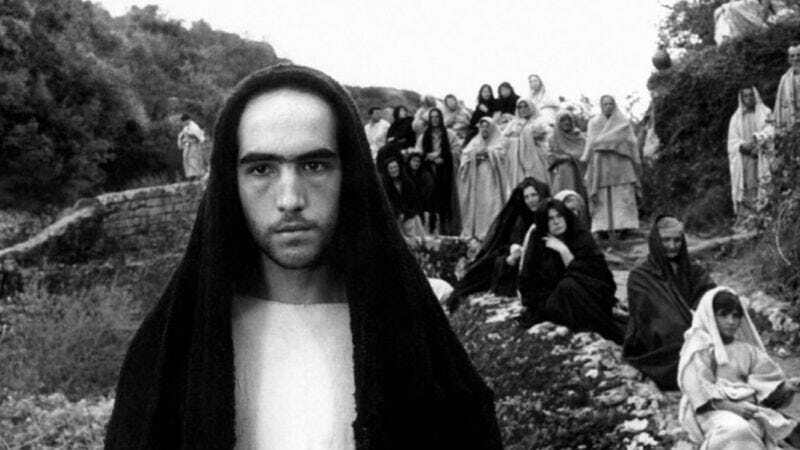 When Jesus is on trial before the Pharisees, Pasolini’s camera lurks behind the gathered masses, so Jesus is but an insignificant figure, far off in the distance. When he is nailed to the cross, the focus is on the face of his aged mother (Pasolini’s own mother), warped with anguish. When he comes walking to the disciples across the water, he seems almost a tiny figure, surrounded by the vastness of the sea. Even the miracles here are human-sized, approachable. Pasolini’s choice to fill most roles with non-professional actors accomplishes the same, giving the film the feeling of something almost willed into being by a collection of players who just happened to assemble. The Gospel According To St. Matthew wasn’t the first or last film to go looking for the human amid the divine. But by making even Christ’s godliness seem like an essential extension of his own humanity, Pasolini made a movie not calling for salvation, but for hope and understanding. Availability: The Gospel According To St. Matthew is available on DVD, which can be obtained through Netflix, and to rent or purchase through the major digital services. (Beware, though: VUDU offers only the colorized version; Amazon offers the proper, black-and-white version, but only to purchase.) The film is also available to stream in its entirety, for free, on YouTube.